Suzi Kallam writes at the Church at Charlotte blog of losing, and gaining, sight. Then one day what had been merely annoying morphed into full-blown distorted vision. My right eye was unable to see any shape without it appearing to resemble an hourglass. A trip to a retina specialist confirmed my fear: something was decidedly amiss.I wish my reaction to this news had been neat and tidy, and I could nonchalantly slip in a handy little formula for dealing with life’s interruptions. How pleasant it would be to share with you the firmness of my faith and my unwavering trust in God.The truth, however, reads differently. Prior to the procedure, my hidden thoughts were mutinous. The loss of vision and ensuing procedure couldn’t have come at a worse time. I was busy with Bible study, Encourage, and a host of other things. The disruption was unwelcome. Nancy Wolf wrote this piece at the Washington Post last fall and I happened upon it again this past week. She encourages parents to hear what’s behind the words when another parent shares–or doesn’t share–about their kid’s successes. One Yiddish word I didn’t learn until I became a Mom is “kvelling” – when a person is bursting with pride and pleasure…When Lisa, Michelle and Denise’s kids were in elementary school, mine were of high school and college age. Kvelling gets a bit trickier as your kids get older. Especially if your kid happens not to be on the direct path from high school to early admission into Harvard, then on to elite grad school or Wall Street or a fancy internship. What happens to kvelling if your kid is on his or her own very different path? Sarah Moudry shares some thoughts on how we help our young children process the experiences of their day. James Witmer challenges us to invite our children into our own hobbies–even those ones we think might be too “grown up”–for they may discover things we never realized were there. When I was about fourteen, friends of the family unexpectedly gifted me a week with a summer backpacking camp. We were to hike every day, sleep in tents, cook outdoors, and end miles from where we started.This was the first time my dad offered me his collection of hiking and backpacking books to read. I remember that most of them were engagingly, even humorously, written. I felt welcomed into a new world, where people argued good-naturedly about the merits of leather versus canvas boots. Paul Boekell’s artwork. 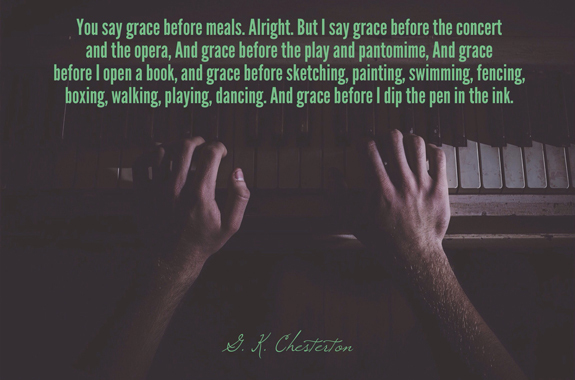 G.K. Chesterton’s words. Not a bad combo. My wife Gina wrote a short review of The King of Little Things and you can read that here. We love the book as a family and have snuggled up many times in our cozy home in West Virginia to read it. So imagine our surprise when we learned later that Bil Lepp, the author, was from just down the road? Lepp is a West Virginian, which makes him okay in our book, and his book is far from just okay. Bil is a storyteller and the five-time champion of the West Virginia Liars Contest. But we speak the truth when we say that our family loves the book and we commend it to you. Kelly Keller introduces us to a springtime poem by James Whitcomb Riley. Enjoy some spring–whether it’s arrived in your yard yet or not. Speaking of springtime, here are six ways to make flowers! Try them out with your family and see which you enjoy most. You may have considered beekeeping once. You may actually keep bees. But most of us, I’d wager, get our honey at the grocery store. 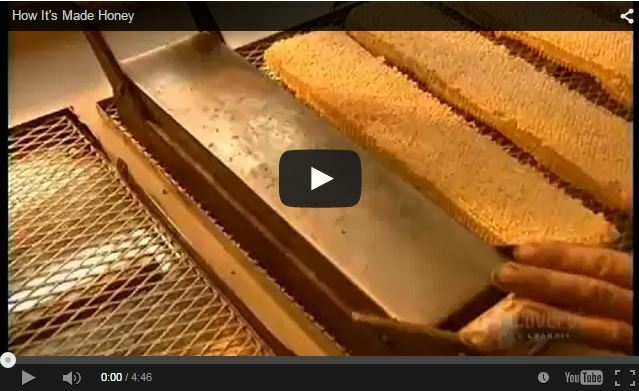 If you do, you may not have considered how the honey gets from the hive to your toast.